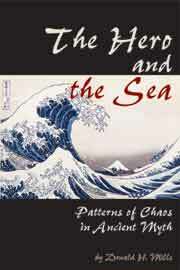 The Hero and the Sea examines the mythological pattern of heroic battles with watery chaos in the Gilgamesh Epic, the Iliad, the Odyssey, and the Old Testament, in the light of anthropology, comparative religion, literature, mythology, psychology, and modern chaos theory; how mythic patterns of heroic battle with chaotic adversaries respond to the cultural needs, religious concerns, and worldview of their audience. The last chapter explores points of contact between the ancient mythic patterns and the discoveries of modern scholars engaged in the theoretical study of chaos and chaotics. An overt structuralist, M takes episodes from the stories of Gilgamesh, Achilles, Odysseus and Jacob, considering the parallels between the heroes in their struggles to overcome the forces of nature, and the meaning behind the stories for their native communities. Strong points are his application of the thesis that myths are a community's attempt to create order in an unpredictable world and work with ritual to try to explain or control universal forces. His use of the concepts of liminality and social unity is also helpful in delineating the roles of the heroes. He introduces tangential but thought-provoking ideas, for example assessing Achilles and Odysseus in the light of the experience of US troops in Vietnam. Finally, summarising modern theories of chaos (another means of explaining the workings of the universe), he finds surprising similarities with ancient narratives. At times slightly irritating due to his passion for fitting all elements of the myths into the pattern, this nevertheless sheds some interesting light from an unusual perspective on well-trampled texts.